This recording was taken from the same excellent collection of tapes which has yielded so many Toscanini recordings recently. Thanks to ongoing refinements to the Pristine Audio XR process I have been able reduce digital tape hiss reduction to the barest minimum, despite the source being quite badly afflicted, whilst retaining a clear and sharp sound picture. I was also, thanks to the very latest developments in audio restoration technology, able to excise what sounded distinctly like an aeroplane coming in to land in the background during a particularly quiet section, midway through the second movement (from ~15'56") , without disturbing any of the musical content. As is sometimes the case with tapes recordings of the early 1950's, there was a gradual alteration in recording speed, causing a rise in pitch of approximately 0.15 semitones across the duration of the recording, something it has also been possible to rectify, and which allows the finely tuned precision of the XR process to work at its very best. 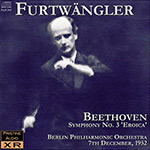 The end result is, I believe, another restoration which sets new standards for sonic quality in recordings of this era, I hope allowing the listener to get closer than before to the fine essence of Furtwängler's concert Beethoven, in this, the penultimate in a series of Eroica concerts he gave in Vienna and Berlin at the end of November and beginning of December, 1952. BEETHOVEN Symphony No. 3 in E flat, Op. 55, "Eroica"